We’d love your help. Let us know what’s wrong with this preview of How an Economy Grows and Why It Crashes by Peter D. Schiff. 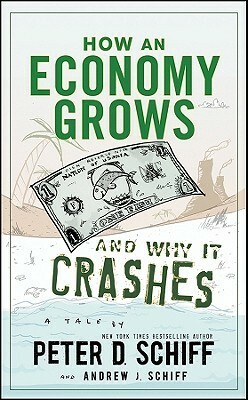 How an Economy Grows and Why it Crashes uses illustration, humor, and accessible storytelling to explain complex topics of economic growth and monetary systems. In it, economic expert and bestselling author of Crash Proof, Peter Schiff teams up with his brother Andrew to apply their signature "take no prisoners" logic to expose the glaring fallacies that have become so ing How an Economy Grows and Why it Crashes uses illustration, humor, and accessible storytelling to explain complex topics of economic growth and monetary systems. In it, economic expert and bestselling author of Crash Proof, Peter Schiff teams up with his brother Andrew to apply their signature "take no prisoners" logic to expose the glaring fallacies that have become so ingrained in our country’s economic conversation. Inspired by How an Economy Grows and Why It Doesn’t—a previously published book by the Schiffs’ father Irwin, a widely published economist and activist—How an Economy Grows and Why It Crashes incorporates the spirit of the original while tackling the latest economic issues.With wit and humor, the Schiffs explain the roots of economic growth, the uses of capital, the destructive nature of consumer credit, the source of inflation, the importance of trade, savings, and risk, and many other topical principles of economics. To ask other readers questions about How an Economy Grows and Why It Crashes, please sign up. همین ابتدا بنویسم که کتاب یک داستان است که با سه نفر در یک جزیره و ماهیگیری آنها شروع میشود و تا چند نسل بعد از آنها جلو می رود. پر از تصاویر کارتونی است . فکر میکنم کسی ترجمه پارسی این کتاب را بخونه تا تمومش نکنه کتاب را زمین نمیزاره(با توجه به اینکه حجم کتاب هم زیاد نیست!) اگر چه من متن اصلی را خوندم و خیلی کم فرصت میشد سراغش برم اما ذهنم زیاد درگیر داستان کتاب بود همچنین به نیش و کنایه هایی که کتاب به شخصیتهایی که می شناختمشون(اسمشون هم مشابه اسمهای واقعی بود!) میزد . کتاب نقد شدیدی به کینزین همین ابتدا بنویسم که کتاب یک داستان است که با سه نفر در یک جزیره و ماهیگیری آنها شروع میشود و تا چند نسل بعد از آنها جلو می رود. پر از تصاویر کارتونی است . فکر میکنم کسی ترجمه پارسی این کتاب را بخونه تا تمومش نکنه کتاب را زمین نمیزاره(با توجه به اینکه حجم کتاب هم زیاد نیست!) اگر چه من متن اصلی را خوندم و خیلی کم فرصت میشد سراغش برم اما ذهنم زیاد درگیر داستان کتاب بود همچنین به نیش و کنایه هایی که کتاب به شخصیتهایی که می شناختمشون(اسمشون هم مشابه اسمهای واقعی بود!) میزد . کتاب نقد شدیدی به کینزینها و دخالت دولت در اقتصاد دارد. در هر صورت نویسندگان نگاه اقتصاد آزاد را دارند و معتقد به مکانیسم بازارها هستند. در خلال داستان کتاب گریزی به مباحث روز اقتصاد آمریکا می زند و با داستان مقایسه میکند. گرچه داستان بسیار ساده است و هر فردی میتواند آنرا بخواند و کم و بیش با ساختار اقتصاد و آنچه در آن بحث میشود آشنا شود اما وقتی کمی بیشتر به عمق مطالب می روی و آشنایی با ساختار اقتصادی آمریکا و اندیشه های اقتصاد داشته باشی کتاب پر از چالش میشود . ساده سازی بیش از حد کتاب اذیتت میکند اما آموزنده است . کتاب یک نماینده خوب برای حوزه عمومی اقتصاد و معرفی یکی دو جریان غالب اندیشه در اقتصاد می باشد که در آن چگونگی تقسیم کار، پس انداز،تشکیل سرمایه،سود،مبادله و تجارت،تشکیل نهاد ها و سازمانهای اقتصادی ،ایجاد بحرانها در اقتصاد و . . . را بحث میکند . بنابراین خواننده عمومی با این ساختار ها به خوبی آشنا میشود و لذت می برد. خواننده ای که از اقتصاد می داند طنزهای بکار رفته در طول کتاب و مقایسه اش با وضعیت فعلی ایالت متحده و علل بحران اخیر اقتصاد را از دید نویسندگان کتاب می بیند و لذت هم می برد. If you read this one book, and then formulate your opinions about the market with this material alone, you are a moron. This book will forever stick in my memory as a yardstick to determine intelligence by. I told my wife that it isn’t bad, per se. It’s just stupid, wrong, and written for a 5th grader. Admittedly, it simplifies a huge problem in a concise manner… but that’s the problem. It is such an oversimplification that it allows the author to subtly interject erroneous beliefs into the narr If you read this one book, and then formulate your opinions about the market with this material alone, you are a moron. This book will forever stick in my memory as a yardstick to determine intelligence by. I told my wife that it isn’t bad, per se. It’s just stupid, wrong, and written for a 5th grader. Admittedly, it simplifies a huge problem in a concise manner… but that’s the problem. It is such an oversimplification that it allows the author to subtly interject erroneous beliefs into the narrative. The technique is simple, dumb the subject matter down enough for the American masses, and then interject populist notions with thinly veiled race baiting in order to convert a preconditioned audience. There is a kernel of truth to the overlaying theme, which makes it easy to slip not only incorrect notions into the work, but dangerous ones as well. نثر کتاب و داستانی بودن و طنزش خیلی دلنشین بود و باعث می شه به واقع همون طور ک مترجم هم گفته ادم نتونه کتاب رو زمین بذاره و یهو تا اخر کتاب می خونه و تمومش کنه. Peter Schiff exposes the flaw in Keynesian economics through the use of an extended allegory or parable. His story involves an island nation that grows from subsistence living to great prosperity and then declines. The island nation represents the United States. The story serves as a warning against Keynesianism. In the beginning, there are only three men. Each man catches and eats one fish per day. Then, one man decides to forgo his meal for the day to build a net, which proves successful and su Peter Schiff exposes the flaw in Keynesian economics through the use of an extended allegory or parable. His story involves an island nation that grows from subsistence living to great prosperity and then declines. The island nation represents the United States. The story serves as a warning against Keynesianism. In the beginning, there are only three men. Each man catches and eats one fish per day. Then, one man decides to forgo his meal for the day to build a net, which proves successful and subsequently enables him to catch two fish in less time. This man uses the additional resources (free time and extra fish) provided by the net to lend, trade, and relax. Thus, the expansion of the economy begins. Other people on the island take similar risks. Schiff uses this simple storytelling device to introduce the reader to economic topics such as risk, capital, interest, money, inflation, bubbles, and busts. Peter Schiff is a free market libertarian who sees the government as the source of misallocation of scarce resources. His story traces the rise of the United States as an economic powerhouse from its inception through the first part of the 20th century. Then his story tracks its decline into economic stagnation following the ascendancy of Keynesianism, the income tax, and the Fed. 1. Paper dollars have no intrinsic value. 2. Printing more paper dollars will decrease the value of all other paper dollars. 3. An economy is strong and grows because people produce goods and services. 4. Consumption does not create a strong economy by itself. 5. An individual or nation cannot become wealthy simply by consuming. 6. The massive debt and deficits of the United States cannot be sustained. 7. To deal with the massive debt and deficits, the United States can a. inflate, b. raise taxes and lower services, or c. default. 8. Deflation, which is simply gently falling prices, is the natural result of a healthy economy free of government interference. 9. Deflation arises because of increasing efficiencies of production. 10. Deflation is a good thing for all consumers. 11. Inflation is the result of politicians making promises that can’t be fulfilled. 12. Politicians monetize the debt, which simply means inflate the currency to technically fulfill their promises. 13. Inflation harms savers and helps debtors. 14. Saving is the necessary prerequisite for capital accumulation. 15. Capital can be thought of as something to help us make something else that we want. E.g., a shovel, a tractor, a factory, or any other tools. 16. Capital accumulation is the necessary prerequisite for an expanding, healthy economy. So if Keynesianism is bunk, why is it so widely accepted amongst politicians and economists in academia? Schiff says that Keynesianism gives the appearance of a free lunch. It promises an unending economic boom based on spending. By encouraging politicians to spend, they can buy votes—politicians love to spend. How did the idea infest the academies? Those universities with people in high political offices get better grants and more prestige. Any economist who would tell a politician the truth that their officious meddling is causing more harm than good, that spending in one area creates asset bubbles and misallocations of resources, that saving a high paying job in industry A comes at the expense of all the other industries because customers have less money to spend elsewhere would not have that politicians’ ear for very long. Moreover, it is politically appealing for a politician to promise the world: a guaranteed job, a chicken in every pot, security in one’s old age even if you haven’t saved anything yourself, a Great Society with free housing and food stamps, free healthcare. This is a much more gripping and emotional tale than a stoic recitation of the importance of free markets and the gradual progress of innovation. There are less concrete guarantees in a free market even though such a system is precisely what enables politicians to promise to “spread the wealth around” in the first place. In the end, economics is ultimately the “dismal science.” There are no solutions, only tradeoffs. Keynes tried to change all that with faulty promises that too many have bought into. The United States, like France, the Confederacy, the Weimar Republic, Hungary, Argentina, Yugoslavia, Zimbabwe, and many others risks hyperinflation with its loose monetary policy and the lack of a currency backed by something tangible, such as gold. Schiff says that borrowing from China has enabled the U.S. to hold off tough decisions for a long time. China gives us goods and we give them increasingly worthless paper dollars. That situation can’t last forever. در اصل نویسنده ی کتاب ایروین شف است. پدر پیتر و اندرو. او یک اقتصاددان بود و هنگام مسافرت و در ترافیک برای پسرهایش قصه های اقتصادی تعریف می کرد. قصه هایی خنده دار که مهم ترین مفاهیم اقتصاد کلان را در مغز پسرهایش حک می کردند. داستان جزیره ی اوسونیا در نگاه اول خنده دار و جالب است، ولی بعد که نگاه می کنی می بینی چه قدر با ظرافت مفاهیم غیرقابل تصور اقتصاد کلان را توضیح داده. ایروین این داستان ها را اولین بار در کتاب "بزرگ ترین کلاه بردار دنیا: چگونه دولت شما را لخت می کند، غارت می کند و می چاپد" چا در اصل نویسنده ی کتاب ایروین شف است. پدر پیتر و اندرو. او یک اقتصاددان بود و هنگام مسافرت و در ترافیک برای پسرهایش قصه های اقتصادی تعریف می کرد. قصه هایی خنده دار که مهم ترین مفاهیم اقتصاد کلان را در مغز پسرهایش حک می کردند. داستان جزیره ی اوسونیا در نگاه اول خنده دار و جالب است، ولی بعد که نگاه می کنی می بینی چه قدر با ظرافت مفاهیم غیرقابل تصور اقتصاد کلان را توضیح داده. ایروین این داستان ها را اولین بار در کتاب "بزرگ ترین کلاه بردار دنیا: چگونه دولت شما را لخت می کند، غارت می کند و می چاپد" چاپ کرده بود. سی سال بعد پسرهایش به آن قصه ها داستان بحران مالی 2008 آمریکا را هم اضافه کردند و کتاب را به روز کردند. قبلا چند صفحهای از نسخهی ترجمهی دکتر ارباب رو خونده بودم و گذاشته بودم کنار. اما این یکی ترجمه «سهند حمزهئی» رو همین که شروع کردم به خوندن، تا آخر خوندم. نه این که خیلی جذاب باشه، بلکه ترکیب جذابیت و روان بودن و وقت آزادم باعث شد یک ریز تا آخر برم. مخصوصا که یه طنز کوچولویی هم داره. کتاب ویژگیهایی داره که برا اقتصاد آمریکا مناسبترش میکنه. مثلا خرید و فروش وام و شرکتهایی که تضمین وام میدن و این تا چند سطح میتونه بره. یا سیستم وام مسکن و وام دانشجویی و هزینههای دانشگاه آمریکا با سیستم ایران خیلی فرق قبلا چند صفحه‌ای از نسخه‌ی ترجمه‌ی دکتر ارباب رو خونده بودم و گذاشته بودم کنار. اما این یکی ترجمه «سهند حمزه‌ئی» رو همین که شروع کردم به خوندن، تا آخر خوندم. کتاب ویژگی‌هایی داره که برا اقتصاد آمریکا مناسب‌ترش می‌کنه. مثلا خرید و فروش وام و شرکت‌هایی که تضمین وام میدن و این تا چند سطح می‌تونه بره. یا سیستم وام مسکن و وام دانشجویی و هزینه‌های دانشگاه آمریکا با سیستم ایران خیلی فرق می‌کنه. همچنین اقتصاد آمریکا با ویژگی‌های خاص دلار(که نویسنده در کتاب چند بار اشاره می‌کنه) با اقتصاد ایران و نفتش و ریالش خیلی فرق می‌کنه. اما با این حال حس خوبی دارم برا وقتی که براش گذاشتم. This book is pure, unadulterated genius. It explains where we’ve come from and where we’re headed. It explains how Keynesian ideas have prospered over Austrian economics, even though they are utterly, hopelessly wrong and are ruining our country. I cannot recommend this highly enough to anyone who cares about America. I read it in two days, easily, and so can you. Who doesn’t have two days to change their life? We are told that we must go deeper into debt to fix out debt crisis, and that we must spend in order to prosper… The disconnect results from the nearly universal acceptance of the theories of John Maynard Keynes, a very smart early-twentieth century English academic who developed some very stupid ideas about what makes economies grow. As a consequence of their pro-government bias, Keynesians were much more likely than Austrians to receive the highest government economic appointments. Universities that produced finance ministers and Treasury secretaries obviously acquired more prestige than universities that could not. Inevitably economics departments began to favor professors who supported those ideas. Austrians were increasingly relegated to the margins. The truth is that the Fed now exists for the sole purpose of providing the inflation necessary to allow the government to spend more than it collects in taxes. During the Depression, President Roosevelt decided to devalue the dollar against gold. In order to pull this off, the government had to control the entire gold market, and for a time the government made it illegal to own gold coins. Later on the ability to redeem the notes for gold was restricted to just banks, then to just foreign banks, and then finally to no one. We are left with a currency that has no real value and can be expanded at will. This has prevented the government from ever having to make hard choices about spending and taxes, and has set us on a path that will eventually destroy the remaining value of the dollar. Although economists talk like they have seen it all before, the truth is humanity simply has no long-term precedent for universal economic activity based on irredeemable paper money… now we are in a “through the looking glass” world where, for the past 40 years, no country issues real money. This is the biggest monetary experiment even conducted. No one knows how or when it will end. But rest assured, it will. When the economy started to contract, lawmakers and economists treated the development not as the inevitable consequence of years of easy money and overspending, but as the problem itself. In other words, they mistook the cure for the disease. An economy can’t grow because people spend; people spend because an economy grows. The creation of ever greater quantities of debt has given us a reprieve from the process of returning to living standards commensurate with our productivity. But at some point in the foreseeable future, perhaps in the next few years, we will have a very ugly encounter with our debt. France in the 1790s, the Confederate States of America in the 1860s, Germany in the 1920s, Hungary in the 1940s, Argentina and Brazil in the 1970s and 1980s, and Zimbabwe today. In all of these instances the circumstances that led up to the hyperinflation, and the economic devastation that followed, were remarkably similar. The countries satisfied staggering debt by wiping out the value of their currencies. As a result, their own populations were thrown into abject poverty. As a basic primer on the evolution of economies, this book is a light and fluffy start for the layman. Where it is flawed, however, is that it's written with a conclusion already in mind and the analogy on which it builds is therefore twisted to suit that view. The trouble is that the gold standard, which this book extols, is not the same as an economy based on fish - fish being a resource which can be replenished and grown. A real economy, based on gold, can only be stifled by t Fun, but flawed. well, If you are destined to become a successful person, then facing your personal issues wouldn’t be a problem for you. People in general, have very little knowledge of how the economy affects our daily lives, regardless of our interests. Sometimes, the lower-class citizens are entirely neglected by the government, which makes it even hard for people with their set of skills to find a job. In the final analyses, Schiff is convinced that the countries should eradicate the concept of minimum wage. well, If you are destined to become a successful person, then facing your personal issues wouldn’t be a problem for you. People in general, have very little knowledge of how the economy affects our daily lives, regardless of our interests. Sometimes, the lower-class citizens are entirely neglected by the government, which makes it even hard for people with their set of skills to find a job. In the final analyses, Schiff is convinced that the countries should eradicate the concept of minimum wage. This book reflects my views and style more than anything I have read that's not my own. Hence the rating could not have been any different! Economic theories need to be de-jargonized every now and then to understand the stupidity of some of the things that policymakers do or are recommended to do. Extremely few people, with many experts excluded, tend to understand the basic meaning of some their pet economic solutions or policies. Complex theories effectively lead to equivocation, obfuscation of This book reflects my views and style more than anything I have read that's not my own. Hence the rating could not have been any different! Economic theories need to be de-jargonized every now and then to understand the stupidity of some of the things that policymakers do or are recommended to do. Extremely few people, with many experts excluded, tend to understand the basic meaning of some their pet economic solutions or policies. Complex theories effectively lead to equivocation, obfuscation of who bears the real costs (often future generations, or disconnected people) of things that appear like free lunches or financial/economic progress. More often than not gains our of economic decisions come at extreme costs and only jargon-less observance could lead to a discussion of true cost-benefits.This is what the book tries to do for the way at least one type of economic cycle is generated in this book. One may or may not agree with the theories or conclusion, but one is unlikely to walk away without new understandings. The book, in all its simplicity, is witty and hits home some basic truths not told in economic textbooks these days. Its scope is broad and brush too narrow as a result its simplicity becomes a hindrance. The conclusions are too sweeping and most-tellingly ignore the "time" element. This is a book more for people who want to think about the implications of economic theories on real life, for decision makers in policy but not for most financial market investors. The book walks you through the basics of "island economics," in which FUNDAMENTAL ECONOMIC PRINCIPLES in a hypothetical three-man (initially) economy are explained. It is basically an allegory of the US economic history riddled with lots of illustrations that add visual dimension to the humor in which the authors present the story. No, a touch of humor does not at all downplay the seriousness of the subject matter, nor does it detract anything from the LOGIC and COMMON SENSE in the economic principles described. Worum ging es in dem Buch? Dieses Buch erklärt den Verlauf der Wirtschaft der USA mithilfe einer Parabel: Drei Männer leben auf einer Insel. Die Wirtschaft wächst und es kommen mehr Menschen hinzu, weil immer wieder Unternehmer Opfer und Risiken auf sich nehmen, um Werte zu schaffen. Es entsteht ein Staat, der den Markt immer mehr verzerrt. Es erfolgt der Übergang zur Papierwährung, Blasen und Crashs. Ich habe leider nicht viel gelernt, was ich vorher schon wusste. Allerdings Worum ging es in dem Buch? Ich habe leider nicht viel gelernt, was ich vorher schon wusste. Allerdings war es unterhaltsam, das Buch zu lesen und mir wurden manche Konzepte nochmal ins Gedächtnis gerufen. Einzelne Fakten waren mir neu. Welche drei Fakten, Ideen oder Prinzipien möchte ich mir am meisten merken? * Die Prinzipien, die im Familienhaushalt gelten, gelten auch im Staatshaushalt. * Es ist sehr nützlich, in Allegorien zu denken, wenn man etwas aus der Volkswirtschaft nicht versteht. Very entertaining and a remarkably easy read. Schiff argues compellingly that the basic principles of an economy remain basically the same between large and small economies. He allegorizes how an economy grows in the story of small fishing economy, providing many clear insights in economics along the way. This book must be read at an age when your mind is ready to differentiate between the prevalent economic ideologies and their merits/demerits but certainly not before an age where you cannot locate the fallacies in the author's arguments. Without any background in economics, I personally wish I could have read it before my post-graduation in business management. A really good easy explanation for what's happening with our economy and why, for people who couldn't be further from economic theory. Perfect. Can this be required reading for our federal government and ALL high school seniors? This instead of a standardized test please. The book’s characters also have names very similar to the real life people behind the real events (e.g. George W. Bass, Ben Barnacle e Barry Obuda). It’s a short book but you gotta read with attention for the writer condenses a lot of different technical terms and information in every paragraph. Mimo uproszczeń, wciąż świetna książka, która wyjaśnia przyczyny i skutki globalnego kryzysu z lat 2007-2010. W jasny sposób opisuje dlaczego ten problem nie został jak dotąd rozwiązany i dlaczego jego przykre konsekwencje zostały jedynie odroczone w czasie. به طور کلی کتاب در مورد اصول شکل گیری اقتصاد و سپس اقتصاد آمریکاست، اما خیلی جالب بود که اشتباهات اقتصادی آمریکا توسط ایران مو به مو در حال اجراست. کتاب بسیار جذابه که اگه بگیرید دستتون واقعا سخته دوباره زمین بزاریدش. Reading this book will show you what is really going on with both our domestic and global economies. It's written in a simple story form but also contains additional information that digs a little deeper. Economy will be better off by running free market. Artificially low interest rate to stimulate spending is not the way to boost/recover the economy. The governments attempts to smooth out the volatility of free markets by expanding the supply of money and running large budget deficits when times were tough set a greater fall in the future. debt in the same currency. With Economy will be better off by running free market. Artificially low interest rate to stimulate spending is not the way to boost/recover the economy. The governments attempts to smooth out the volatility of free markets by expanding the supply of money and running large budget deficits when times were tough set a greater fall in the future. The economic activity of Underconsumption and risk-taking can lead to improvement in living standards. These self-sacrifices lead to the creation of capital. can people actually get more of what they demand. improved their economic futures without having to go hungry. are unable to pay back the loan, it’s Able who takes the loss. Essentially, the lender can benefit only if the borrower benefits. "Simple logic, if I lend you money, I will hope you strive and pay me back later with interest"
other members of the community, why would he hoard it? by personal gain to raise the living standards of others. would be counted as $1 million worth of growth. produced to give the spending any value. fish he earns will enable him to buy more things. result, prices tend to come down over time. demand is to allow prices to fall to more affordable levels. destruction of jobs in other areas. and disputes, more than compensated for the lost savings. the scene, prices started rising steadily. remaining value of the dollar. as an expansion of the money supply. rebalance the economy. Recessions should be deflationary. Falling prices will cushion the blow of low employment. Americans. That way we can spend even if we don’t save. lethal combination for our debt-fueled economy. began running persistent trade deficits. Normally, trade deficits tend to be self-correcting. keep runaway trade imbalances in check. grief, especially for the citizens of the offending country. money would arise in the country itself. how or when it will end. But rest assured, it will. all involved, in truth, the system created great dangers. encouraging hut ownership and education. collects in taxes and what it borrows or prints. is worse, it is also the more politically expedient. creditors, most notably China and Japan, eventually must. enjoy the fruits of their labor. stores suddenly found themselves stocked with goods. chasing fewer products was soaring prices! 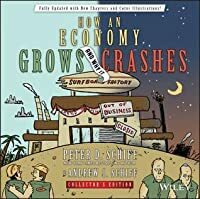 “How an Economy Grows and Why it Crashes” is an enjoyable read by Peter and Andrew Schiff. It is obviously a simple allegory, but I think it does a great job to illustrate things that have happened and continue to happen on a global scale. Due to the economics profession, most people believe that macroeconomics is beyond their understanding. Much of the economics profession has (I believe) intentionally obfuscated basic concepts to put them out of reach of the layman. I laughed out loud a few ti “How an Economy Grows and Why it Crashes” is an enjoyable read by Peter and Andrew Schiff. It is obviously a simple allegory, but I think it does a great job to illustrate things that have happened and continue to happen on a global scale. Due to the economics profession, most people believe that macroeconomics is beyond their understanding. Much of the economics profession has (I believe) intentionally obfuscated basic concepts to put them out of reach of the layman. I laughed out loud a few times throughout this book; the Schiffs certainly have good senses of humor. “Slippery Dickson”, based on Richard Nixon, and “Ben Barnacle”, based on Ben Bernanke, were just a couple of the many funny names and characters in here. “How an Economy Grows and Why it Crashes” is the story of three men on an island. Each of these men has to fish with his hands all day to catch the one fish he needs to survive to the next day. Finally, one of the three men decides to under-consume for a couple days to build a net-type device that he believes would make him a more productive fisherman in the future. After this under-consuming, he succeeds in building the net and becomes much more productive than the other men on the island. He begins to hoard the fish that he catches at a much faster rate than the other two men, but then agrees to lend the other men fish for a couple days while they build their own nets in return for a payoff of more fish after they build their own nets. The others succeed in building their nets, repay the first man, and then the three are able to specialize because they do not need to spend all day fishing to have enough food to survive. The rest of the book continues like this, building from the three men to a small society of people (fueled by immigrants coming in from abroad). The island becomes a nation called Usonia and adopts a constitution much like the U.S. Constitution. The country eventually creates its own currency and then manipulates its currency. I do not want to delve too deep into all of the details and ruin the illuminating parts of the book, but it is an interesting and accessible storyline. Peter Schiff has been one of the most cogent voices throughout the Great Recession and its aftermath, so his analysis is worth the time to read. This is a quick read and is accessible for virtually any age and any familiarity level, so this could be a good introductory book for economic ideas for a young student. A complete novice likely will not be able to appreciate some of the jokes, but it would be valuable and entertaining nonetheless. Economic laws do not cease to exist just because we apply them to a large country like the United States or to a complex global economy like the one in which we live. It is difficult to take what has happened within the United States and apply it to a hypothetical small island society, but I believe that the Schiffs succeeded in doing so with this book. With the simplest and most interesting approach, the author demonstrated the main economic principles staring from microeconomics to the international trade with a highlight on the relationship between china and the US. The book starts by a tale of three men living on an island with one requirement to live,Each one has to catch at least one fish.For simplicity, they spend the whole day to catch that fish.After that, one of them came up with an idea ,that would boost the productivity of the entire With the simplest and most interesting approach, the author demonstrated the main economic principles staring from microeconomics to the international trade with a highlight on the relationship between china and the US. The book starts by a tale of three men living on an island with one requirement to live,Each one has to catch at least one fish.For simplicity, they spend the whole day to catch that fish.After that, one of them came up with an idea ,that would boost the productivity of the entire island, which is catching this fish using a NET.By using this net he could easily catch that fish and starting to SAVE. However, he has to spend a day to make that net which make it impossible to catch a fish in order to live so, he decided to accept the RISK to stay hungry and to make that net.The following day he made the net and it was ready to catch not only one fish but also more than one which means he will be able to consume more than one a day or to save for the future and stay consuming only one fish a day. Although the book only briefly illustrates the philosophy of Austrian Economics, How an Economy Grows and Why It Crashes is a wonderfully concise and entertaining story for those who are unfamiliar with Austrian Economics. The story begins with explaining the nascent of an economy through Crusoe Economics. Economic growth is expanding the use of land and labor through production and savings by restraining present consumption for future consumption in support of more efficient uses by investing in Although the book only briefly illustrates the philosophy of Austrian Economics, How an Economy Grows and Why It Crashes is a wonderfully concise and entertaining story for those who are unfamiliar with Austrian Economics. The story begins with explaining the nascent of an economy through Crusoe Economics. Economic growth is expanding the use of land and labor through production and savings by restraining present consumption for future consumption in support of more efficient uses by investing in capital goods. As an economy grows, property is unprotected, and rule of law is established through a republic. However, over time, government has a deep propensity to expand in power and control, and the most dangerous is the manipulation of currency and interest rates through a central bank. The manipulation of currency and interest rates is the cause of all recessions and depressions. Therefore, as America continues to over consume and over borrow and under produce and under save, it will bring disastrous consequences for posterity. Overall, Peter and Andrew Schiff brilliantly recreate Irwin Schiff’s story into a newly edited version. Peter David Schiff is an American investment broker, author, financial commentator, and was a candidate in the 2010 Republican primary for the United States Senate seat from Connecticut. Schiff is CEO and chief global strategist of Euro Pacific Capital Inc., a broker-dealer based in Westport, Connecticut and CEO of Euro Pacific Precious Metals, LLC, a gold and silver dealer based in New York City. Peter David Schiff is an American investment broker, author, financial commentator, and was a candidate in the 2010 Republican primary for the United States Senate seat from Connecticut. Schiff is CEO and chief global strategist of Euro Pacific Capital Inc., a broker-dealer based in Westport, Connecticut and CEO of Euro Pacific Precious Metals, LLC, a gold and silver dealer based in New York City. He frequently appears as a guest on CNBC, Fox News, and Bloomberg Television and is often quoted in major financial publications and is a frequent guest on internet radio as well as the host of the former podcast Wall Street Unspun, which is now broadcast on terrestrial radio and known as The Peter Schiff Show.